Real Natural Ruby stone ring with star. Sterling silver ring with 925 stamp mark. Origin : Southeast Asian ,Thailand. RING SIZE 9 OR 59. at the side has nice Gothicdesign very unique. 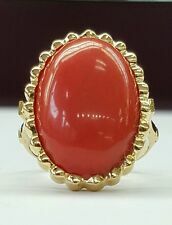 Coral weight approx : 19 Ct, 20 × 14 × 5.6 mm. Ring top size approx : 23 × 17 mm. The top of the Ring is 5/8" by 1/2" wide. Ring Size 7 1/2. Weights 7.3 grams. Genuine 0.18 Ct. 14K Yellow Gold : 1.10 gm (Approx). Turquoise Wt. Gemstone Details. This ring available in all three Gold (Rose / Yellow / White). Diamond Cut Brilliant. You will be greatly appreciated. SAPPHIRE HAS A STUNNING LIVELY CORNFLOWER BLUE COLOR. THE SAPPHIRE HAS BEEN CERTIFIED BY AN ASIAN GEM LAB AND GIA (USA) TO BE A NO HEAT, NATURAL BLUE SAPPHIRE. IT IS LOADED WITH DIAMONDS THROUGHOUT IN AN ELEGANT LACE / SCROLL FILIGREE DESIGN ACCENTED WITH A LARGE CORNFLOWER BLUE SAPPHIRE ON TOP. Ring Weights 3.5 grams. Top of ring is 7/8" by 1/2" wide. End of shank is thin. 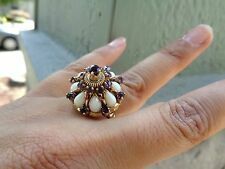 Ring Size : 10.25 US (( I can not change the size of the ring. Main Stone Color : This stone shows that its external color is dark Red without light and when we shed the light from behind it shows its color is Red. ). RING SIZE 7. Free Ring Resizing. Diamond Clarity SI. 14K Yellow Gold : 1.15 gm (Approx). This ring available in all three Gold (Rose / Yellow / White). You will be greatly appreciated. We will surely solve the problem for you satisfactorily. Beautiful 1ct Hand Crafted Natural Brilliant Blue Sapphire & Natural White Topaz Wave Shaped Band Ring Size 7. Ring may be slightly irregular due to the fact it is hand made. FYI: White Topaz is Aprils Modern Birthstone and Blue Sapphire is Septembers birthstone. Main Stone Color : This stone shows that its external color is very dark Red without light and when we shed the light from behind it shows its color is Red. Ring Size : 9 US ( I can not change the size of the ring. ). 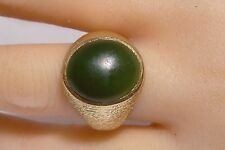 The top of the Ring is 7/8' by 3/4" wide Jade is 15x11mm wide. 4 diamonds are very clean and shinny 0.8 ctw. Ring weights 10.8 grams and size 8. 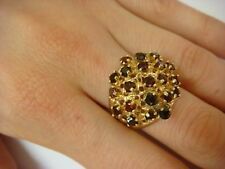 925 Sterling Silver Pave Diamond Ring 14k Yellow Gold Handmade Jewelry. Gross Weight 4.16 gm. Bracelet Earrings Pendant Necklace Bangles. 925 Sterling Silver Wt. Diamond Wt. 14K Yellow Gold 0.071 gm. 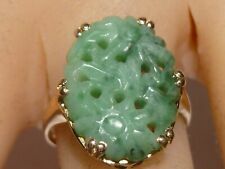 One of a kind lady's jadeite and gold ring, this piece was made from a master craftsman making sure this ring was made to last using good gold and a very nice 6.00 carat oval jade bezel set to assure a tight set. MADE WITH 14K YELLOW GOLD. 585. ALL STONES ARE HAND SET GENUINE RED RUBY FOR A BEAUTIFUL LOOK & SPARKLE! FREE JEWELRY BOX INCLUDED! STONES: GENUINE RED RUBY. COLOR: GOLD TONE. THIS RING IS PRE-OWNED. The main stone of the ring is a hand carved champagne crystal. The stone is natural, not created or enhanced in any way. The carving is giving it a very organic look. The diamonds are F color and VS1 clarity. Ruby Weight: 3.70 ct. Gemco International is the world's premier Gold,Diamond and Gemstone jewelry manufacturer and exporter Since 1974. As a wholesale jewelry manufacturer and exporter, we are acknowledged and renowned for our creativity, aesthetic designs and products. AND ROUND H COLOR, SI CLARITY DIAMONDS 1/3 CTW. 5.4 GRAMS TOTAL WEIGHT.